I've met hundreds and hundreds of ballplayers. But that's during a signing event or at a Baseball stadium. Most of the time I know I'm about to meet a certain ballplayer. I don't think I have met someone just because we are at the same location. I was at a "Puerto Rican Festival" today in San Dimas. Who do I see walking around smoking a Cuban Cigar? 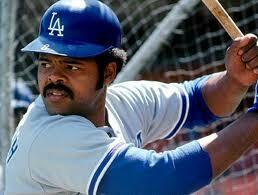 Reggie Smith! The man with 314 Home Runs! I didn't know what do to. I knew it was him but I wasn't 100% sure. The only reason I had a small doubt was because I was thinking to myself why is he at a Puerto Rican festival? Not that he can't enjoy the music and food but still. It was weird. 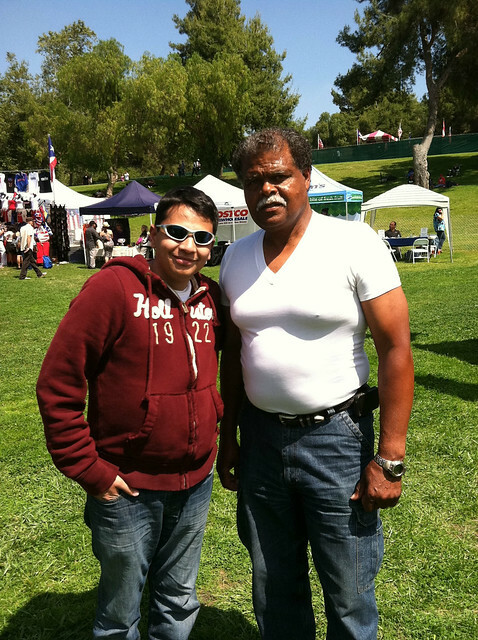 I wasn't going to confront him and ask him "Are you Reggie Smith?". I'm too shy. So I send Erik, my brother in law, who is not a shy person and doesn't really care about anything. Erik walks up to him and says "Hey, are you Reggie Smith?" I wanted to laugh out loud. Not because the way he asked him but the way he approaches him. Erik basically stops him as if he's going to steal his wallet. But I didn't laugh because I was behind him. Reggie says "Yeah I'm Reggie Smi...". I interrupted him when he was about to say Smith. I extend my hand and tell him how big of a fan I am and bla bla bla. Smith was very nice. I wasn't going to get surprised if he just ignored us and walk away after the way we approached him. But he smiled and said thanks. I ask for a photo. I always carry a camera with me in case these things happen. But I didn't have a camera today. Luckily the iPhone does a nice a job. I wanted to ask him a few questions but I know it wasn't the right thing to do. I told him thanks and walked away. Loved that dude when I was a kid. Hard as nails and a damned fine hitter.